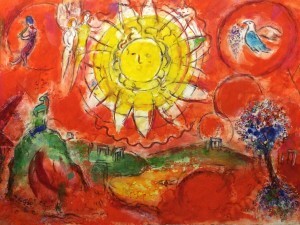 Image: Backdrop design for Daphnis and Chloe, by Marc Chagall, 1958. Yet another eclipse doorway invites us to shine brighter. After the total eclipse two weeks ago, we are nudged to continue progress with yet another Lion’s Roar, maybe a bit quieter and less dramatic this time under partial shadow. Still, it depends on how this one catches you and turns you inside out, as eclipses will do! Mercury retrograde (until August 19) accompanies this fiery, expressive New Moon, suggesting some second thoughts on what we are expressing and how we are doing so. This is a good time to think back over what has been going on in your life, to see it with fresh perspective and clearer eyes. Get new glasses if you need them! Think twice before you speak, and find ways to speak from your heart, loving and strong. Feel your heart beat and make more space for your higher heart to shine out across your sternum and into your throat area, aligning heart and throat chakras. Many hearts are hurting and constrained, inhibited and fearful. Breathe in, and contribute to opening the Heart Space during this eclipse. This will reverberate through the collective fields. This retrograde Mercury is an added caution to the Mars retrograde in progress for another couple of weeks. This regressive movement has been activating reactive rebellion or passive aggression in some quarters, restraint and questioning in others. What are you doing and how are you doing it? Mars is surely catching our attention with its large, bright red radiance in the night sky. As a sign of higher mind, Aquarius is having an extended activation from Mars while it comes so close in, ramping up social unrest and uncovering hidden information. Black Moon Lilith has now entered Aquarius, amplifying the attention on Mars and, if you are missing the point, even exaggerating it. What is the point? That is for you to answer. No standard answers. You might be interested to hear last week’s webinar from the Cosmic Intelligence Agency on Black Moon into Aquarius. See below. New ‘Waves of Grace’ are entering our solar system and sweeping through our cells. This is altering the whole molecular structure of Earth and all creatures— with a wash of higher frequency. This is giving rise to anxiety as many of us are arguing with ourselves about our lives, concepts and belief systems. Many feel a loss of control. Mystic Beth Hin of the White Rose Foundation talked of this in a recent visit to Vermont as “our goodness seeking to remember its strength.” We can be kind and compassionate as well as grounded and centered in our higher Self, without getting out of balance to accommodate others. All this retrograde movement turns us within, rediscovering internal space. Turn off input from the world; find your strength within. Let hope fill your heart, and maintain a steady vision of positive outcomes. Venus in Libra engages with Saturn, strong in Capricorn, and Chiron, fresh and clear in Aries, with feeling that we are at a critical turning point. The balance shifts when we each find our own spiritual center point. Venus’s beauty path is a fine line that flows between polarities, where arguments are superseded by good will. This all becomes even more of a spine-strengthening exercise as Mars returns to Capricorn tomorrow (12th), one of its favorite, most effective signs. Look with a pragmatic lens at your plan of action. Review, consider current success rate, erase unworkable ideas, underline key priorities and redraw the plan. If you don’t have one, that is the task at hand. No fluffy idealism here. There are too many important planets in earth signs necessitating feet on the ground, ready for action when Mars goes forward on August 27. Even then, it will take until September 10 for Mars to reenter Aquarius to align again with Black Moon Lilith, and setting off fireworks with Venus in Scorpio and Uranus in Taurus. Steady yourself, hone your plan, be ready for action. You’ll be in a different place by then, and so, therefore, will the playing field. If you need some clarity on what is opening for you through this eclipse season, a 30 minute check-in could be in order, give you some cosmic inspiration to chew on. Let me know if you can use such insight to help you see the bright side. $75. Book until August 19, when Mercury turns direct.